Keenan Robinson (rib/shoulder/stinger): limited throughout the week and QUESTIONABLE with the nagging body blows that sidelined him against the Saints. Should the Texas product have to sit out another game, second year man Will Compton seemed more than capable in filling in for a spot start at middle linebacker. Robinson will be evaluated on a day-to-day basis. Jason Hatcher (knee/maintenance): DNP on Wednesday and limited on Thursday before fully practicing on Friday with his usual maintenance day that partly has to do with a knee injury related to age. Hatcher, PROBABLE, might not be the same disruptive player he was early in the season, so the Redskins are certainly trying to preserve his motor. Chris Culliver (knee): limited in practice on Wednesday and Thursday (PROBABLE) as the former 49er continues to work back to 100% after dealing with knee inflammation that sidelined him for much of the year. DeAngelo Hall (toe): limited during Wednesday’s and Thursday’s practice (PROBABLE) as the veteran corner continues to deal with a toe injury that had been holding him out of games until last week. Although Hall was active against the Saints, it is clear that he is still not fully healthy as he played only a third of the defensive snaps and was burned by Brandin Cooks on a deep ball where he was not able to accelerate as quickly. Trenton Robinson (hamstring): OUT against the Panthers after being limited on Wednesday and DNP on Thursday or Friday after suffering an injury to the dreaded hamstring in the late stages of the Saints game. Although Jeron Johnson has surpassed Robinson in snap counts at strong safety, Robinson is still an impactful defender with energy on special teams. 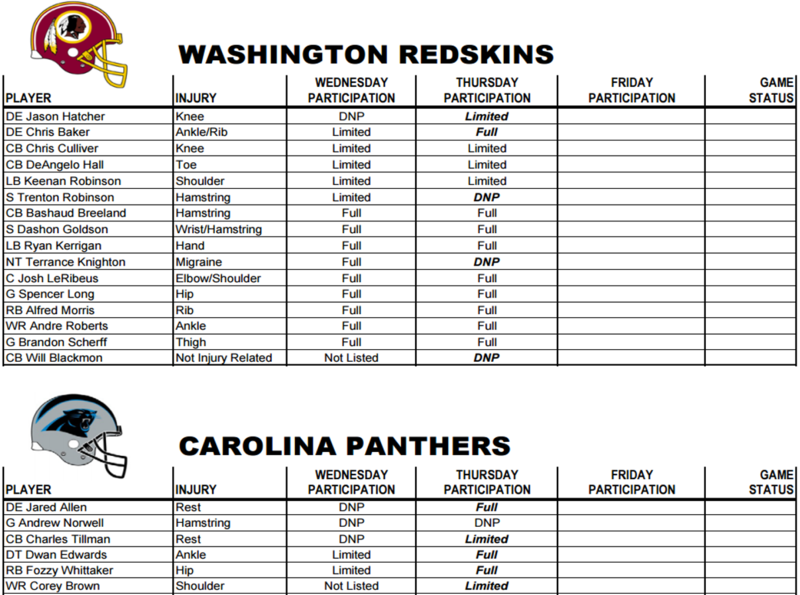 Chris Baker (ankle/rib): a new addition to the injury report as Swaggy Baker was limited on Wednesday, but a full go on Thursday and Friday making him officially PROBABLE. Terrance Knighton (migraine): DNP on Thursday because he had a follow up appointment with a doctor about his migraines after participating fully on Wednesday. Knighton has felt some symptoms again, but Gruden sounded a little bit optimistic as it was just the one time that Pot Roast could get out to see the specialist. Like last week, Knighton will be listed as QUESTIONABLE because of the threat that the pain could become unbearable again. Bashaud Breeland (hamstring), DaShon Goldson (wrist/hamstring), Ryan Kerrigan (hand), Josh LeRibeus (elbow/shoulder), Spencer Long (hip), Alfred Morris (ribs), Andre Roberts (ankle), and Brandon Scherff (thigh) practiced fully throughout the week and thus PROBABLE. This post will be updated as more injury information comes into play up until kickoff on Sunday from Carolina.